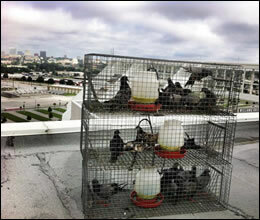 To control pest Bird, Bird trapping is normally followed by Bird relocation. Trapping Birds is not necessary in all cases. Scare tactics and harassment techniques are commonly employed to repel birds. Relocating Birds is the environmentally friendly way to control them. We know how to get rid of a Bird and have years of experience of removing Birds. 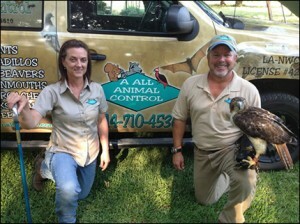 Bird pest control and Bird removal services is one of our specialties at A All Animal Control. Bird extermination or Bird eradication by a Bird exterminator is not in the best interest of this very beneficial animal. Birds extermination would negatively affect the environment and reduce the numbers of insect controlling Birds. Trapping a Bird humanely is important to prevent injury to the Bird. Getting rid of a Bird is a process that should be carried out with proper planning and procedures. Birds removal can be done in an efficient manner with the proper tools and training. If I had a Bird in my attic, I would want a professional Bird remover that could remove the Birds in the attic quickly and humanely. A Bird will sometimes be found on the ground. Do not pick up a Bird that is found on the ground! It could simply be a baby Bird and the mother will take care of it on the ground or it could be infected with West Nile Virus. A problem Bird pest can also live in the attic eaves and fireplace chimney. We can get rid of that Bird in the attic quickly and humanely. We remove Birds using only the latest technology and equipment available. Bird proofing and Bird exclusion provide the best Bird deterrent for reducing the chances of having further Bird problems. There is not any effective Bird repellent to control a Bird infestation. Bird controls that work are only employed by A All Animal Control. A dead Bird in your attic or crawlspace is a service that we provide including the deodorization of the area. Birds do occasionally die in unusual places and they must be removed as soon as possible. We have even found a dead Bird in a wall. Leaving the Bird will only make the problem worse and cause further damage to your home and attract other animals and insects. Animal control for Bird is a necessary service to protect your home and family. Removing Bird is the first step to making your home healthy again. Get rid of Birds the right way before the problem gets out of control.